Tree stumps are a very cliché obstacle in landscaping. Most trees have vast, deep root structures that hold them very firmly into the ground. Traditionally, stumps used to be removed by back-breaking digging and root cutting or, in some cases, by dynamite. Neither of these is a particularly good way to eliminate stumps unless road work or other heavy construction is going to take place where the stump actually sits. Fortunately, there’s a better way to get rid of these nuisances – grinding. 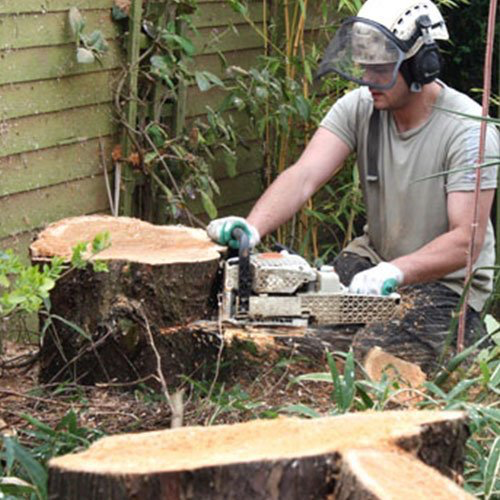 With the proper equipment and training, grinding a stump isn’t really that difficult to do. Unlike traditional removal, grinding doesn’t leave far-reaching scars on the surrounding land. Our crew will use specialized equipment to grind the stump down past the ground, while leaving the root system in place. The result is the obstacle being removed while the surrounding landscaping, foundations and everything else remain unmarred. The roots will gradually decay into compost, fertilizing the soil around them, helping your grass and other plants grow healthier and stronger. Salem Tree Service has been grinding stumps for years and literally have this down to a literal science. We understand the differences made by the size of a stump, the age of the original tree, how long it’s been a stump and the species of tree. These factors do greatly affect the process in a lot of ways, but we’re seen it all and there’s no stump we can’t eliminate for you at a very reasonable price. It may sound like tree removal is the more dangerous job, but this isn’t true. Grinding stumps can be very dangerous due to the types of equipment involved, and the very severe accidents that can occur. Never make the mistake of letting an unlicensed or uninsured company or individual perform this task – leave it up to our trained and experienced professionals. Remember, if you use uninsured services, you’re legally and financially liable for any accidents that occur on your property! First, we clear the area around the stump using traditional hand tools (rakes, shovels) to get as clean a work space as possible. 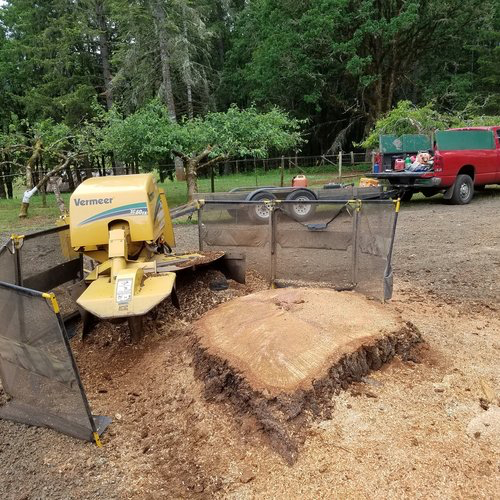 If the stump is particularly tall, we’ll first section off as much of it as we can with chainsaws, which reduces the amount of wood needing to be ground as much as possible. 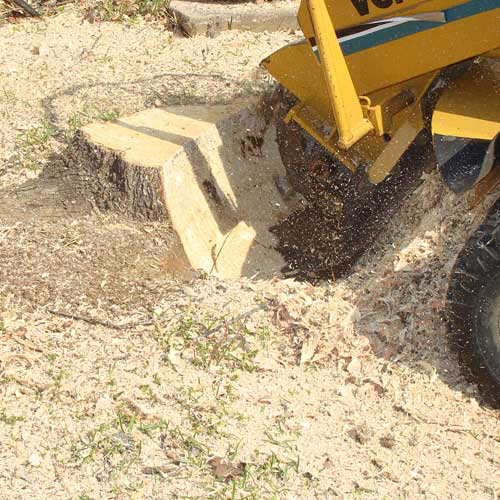 We then place the stump grinder carefully, positioning it for safe and efficient use with minimal mess. The meat of the work then takes place, moving the grinder blades repeatedly to gradually chew down the stump until it reaches a point at least three (preferably six) inches below the ground. We finish by cleaning the area, removing wood chips. We’ll either stack/pile them for you wherever you want or take them to a recycling facility at no extra charge. We don’t leave messes for you to have to clean up. After we’re done, you simply need to fill the hole with soil or any other material of your choice. It’ll be as if the stump was never there. Whether we did your tree removal or not, call Salem Tree Service for a fast, free stump grinding estimate.